This is the second installment of a 3-part series of posts about the benefits of a raw food diet for your cat. Here are links to installments #1 and #3. In the last several years, an increasing number of cat owners have begun reaping the rewards of raw-food diets. Their cats are healthier and happier, making fewer visits to the vet, having increased energy, and probably living longer, happier lives. 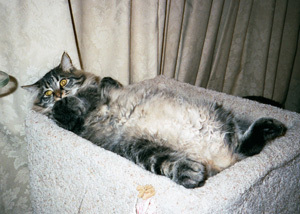 Brodie, our 9-year-old cat had been losing weight for a long time and was lethargic. He had been successfully treated for pancreatitis and a bladder infection but still couldn't gain weight and was still lethargic so I started researching online and I discovered a book written by a veterinarian, Elizabeth M. Hodgkins, titled "Your Cat: Simple New Secrets to a Longer, Stronger Life." Dr. Hodgkins formerly worked for Hills (Science Diet manufacturer) and she talks about kibble as being a bad diet for cats for several reasons. She says it is basically made of cereal and has flavoring sprayed on the outside of it to make it palatable to cats. Since cats evolved as obligate carnivores they don't do well on grains. Also kibbles don't contain the moisture that cats need - drinking water doesn't provide them with enough liquid because they were originally desert animals and don't get as thirsty as they should and therefore they need to eat food that contains moisture. In her book, she talks about cats treated in her practice and talks about how she treats her patients for various diet-related problems. She feeds her own cats a raw diet and she encourages her clients to do the same, but if they can't handle that, she suggests a high-quality canned food diet. After getting Brodie on raw food exclusively, he gained 11 ounces in one month and had been maintaining that weight. He hardly sheds any more and he plays like a kitten. The change in his health has been remarkable. The other two younger cats are doing very well, and we are confident they will be healthier long term since we started them on this diet early. Dr. Hodgkins points out that cats haven't changed much from the wild, desert creatures they were before they were domesticated and they need a diet close to that of their ancestors. They need more protein than most canned cat foods contain and they need a grain-free diet. Dr. Hodgkins makes a compelling case and Brodie seems to prove her right. As of 2016, he is 15 years old and STILL runs around the house like a kitten. A raw food diet for your cat consists of uncooked, minimally processed protein-rich natural meat products specifically formulated for cats. There are many to choose from. I have provided a list below. Of course, you shouldn't simply feed your cat ground-turkey from the corner grocery store. Meat intended for consumption by people is expected to be cooked thoroughly. It probably contains a fair amount of bacteria, and it doesn't contain the dietary supplements your cat needs. Raw pet food is specifically formulated with the intention of being consumed uncooked so there are extra precautions in place to ensure quality and purity. The Next installment will provide information on how to convert your cat to a raw food diet. Here is a link to installment #1. This is the third and final installment of a 3-part series of posts about the benefits of a raw food diet for your cat. Here are links to installments #1 and #2. 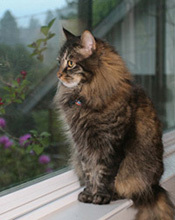 Addressing concerns about raw pet food and converting your own cat to a healthier diet. If you are concerned about things like bacteria and disease, fear not. Commercially-made raw food is carefully prepared and naturally treated for harmful organisms. It does not contain the "guts" of animals - where the bulk of harmful parasites are found (stomach, intestines, etc.). These items are removed as part of the processing. Have you ever noticed your cat leaving you a "present" of mouse guts? That's why. 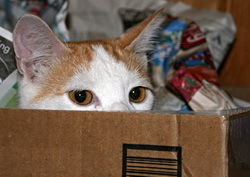 Your cat knows what to do, avoiding the "bad" parts. The "good" organs like the heart and liver are typically included in raw food products, and these are parts your cat will readily consume from live prey anyway. Some of the bacteria we hear about in the news is already present in the digestive flora of your cat, and your cat's digestive system is fairly short, and very well equipped for the consumption and digestion of "live" food. If you're still concerned, make sure your raw food is frozen solid for at least three days, that will also help ensure purity. Raw cat food is as safe as any regulated pet food, and doesn't contain harmful chemicals or substances your cat cannot digest. Of course, the best way to get your cat accustomed to a raw food diet is to start her off young, so she doesn't become used to kibbles and mainstream cat food. Converting a "spoiled" cat to raw food can be a small challenge. It can take a few days, or a few weeks to convert a cat to a raw food diet. Some cats take to it right away, others are a little more stubborn. Cats love routine so getting them from one routine to another can be challenging, but once they get used to the new routine, they usually just settle in. Persistence is key, you may need to be the Alpha Cat in your household for a while. Try to get samples of various raw cat foods to try on your cat. Better pet stores may have samples of some of the more popular raw food products. If canned food already part of diet, conversion may be easier. You can try switching to 100% canned food, then to raw. If your cat just refuses the raw food altogether, don’t force him to not eat. Liver failure can occur within days, sometimes in as little as 12 hours. Try ground up dried chicken liver on top of raw food. Freeze-dried chicken liver can be found at better pet supply stores. Make sure it's 100% just chicken liver and nothing else. Put a small amount - teaspoon or so - of raw food next to a bowl of regular food, this can help your cat associate the food she is used to with the raw food. You can try raw chicken necks (also available at better pet supply stores). Do not cook them. Cat owners who are successful in switching their feline companions to a raw food diet are often amazed by their cat's health improvements. Few ever go back to commercial cat food, and all are helping to improve the long-term health and happiness of cats everywhere. What ever you do, eliminate the dry food (kibble) if at all possible. Replace it with high-quality, high-protein canned cat food. Include some raw food if you can as a supplement or as treats. High quality doesn't mean "Fancy Feast" either. Most high-quality cat foods are found in smaller independent pet supply stores. Some larger commercial retailers stock some of the better products. You may have never heard of some of these brands as they are not mass marketed. The "mass" market is not interested in high-quality cat food. Cheap cat food is what the mass market wants. Cheap means lots of additives, fillers, chemicals and other things your cat was never meant to consume, some of which can actually harm your cat and possibly shorten her lifespan. If you feed treats, choose only pure meat, or cat-specific raw treats. You can dice some non-ground meat from your grocer and cook/boil it lightly (but completely), or you can choose from many excellent freeze-dried treat products. If you purchase pure-meat treat products, it doesn't matter if the packaging says "for dogs" or "for cats." As long as it is pure meat (actual pieces of meat), you can feed it to your cat, but only feed pure meat treats to her as an occasional treat. Your cat's diet needs to be balanced and cat-specific. The following list will help you find high quality alternatives to a 100% raw food diet. Note your cat does not need all those vegetables added to many canned foods, and should not consume grains, potatoes or other carbohydrates either. Make sure the product you choose contains at least 10% "crude protein" (more is better), no grain (rice/wheat), and little if any vegetable ingredients. Be sure to check with your veterinarian about any dietary changes to your cat's routine. I also strongly recommend against purchasing any pet food products imported from or processed in China that you intend on feeding to your cat in large quantities (as her primary food source). All of my recommendations below (with one exception) are either of domestic origin, or other reliable, healthy sources. You can find these products in most independent pet supply stores. The proprietors of the independent stores are an excellent source for information about better pet food products. and in many cases they can be found on the web for better prices, especially if you buy in larger quantities. The links below will allow you to purchase the items directly from Amazon, but you can also shop around the web for better pricing/shipping if you like. Nature's Logic varieties, typically at least 40% crude protein. Weruva varieties, typically at least 40% crude protein. Old Mother Hubbard "Wellness Core" varieties, typically at least 10% crude protein. Note: The above recommendations are for products from manufactures who have addressed recent concerns over BPA in pet-food cans. PureBites treats. Other varieties are available. Bravo Bonus Bites treats. Several varieties are available. 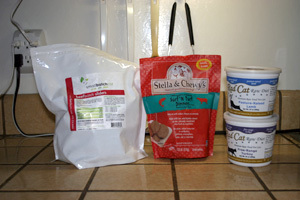 Stella & Chewy's - They offer raw, freeze-dried food which can be given as primary diet or as treats. You can also purchase small sample packages. Many thanks to Vanessa Hill of The Raw Connection in Carmel, California. Her knowledge, expertise and personal experience with raw pet food has been helpful in the research of this article, and invaluable to the well-being of our own three cats. Here are links to series installments #1 and #2. 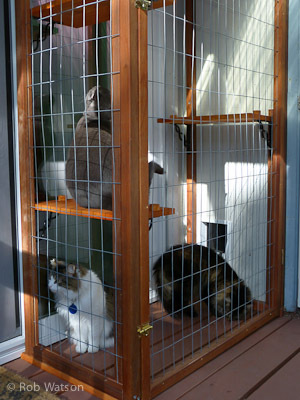 This was a weekend project that was fun to do, looks good and protects your indoor or semi-indoor kitties while affording them a taste of the outside world. There are commercial products like this which can be purchased for hundreds of dollars and have limited customization options. 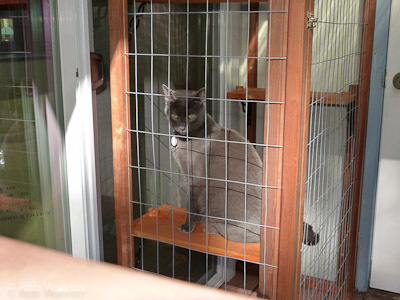 The total cost of this project was under $50 (not including the kitty door which was already installed. The tricky part of this project was that the whole thing had to be secure, but the sliding screen door behind it had to still function. Since kitties love high places and afternoon sun, I also built in three sunning shelves for them to lounge around on. The "front" or large side of the cage is hinged and has two barrel bolt latches. The entire panel can be opened for access. The primary materials are 2 x 6 wire fencing and redwood 2 x 2s. 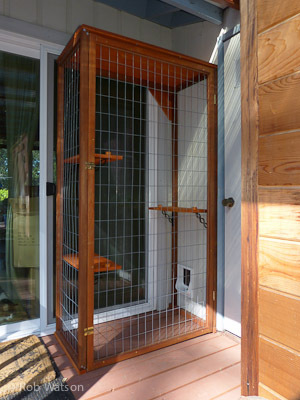 The enclosure is constructed of redwood 2x2s, 4x2 wire fencing, pine shelving and plywood. The 2x2s were slotted down the middle on a table saw, and the wire fencing was "inlayed" into them for a secure fit around the entire perimeter of each panel. I only had to construct two sides and a top. The top is a piece of plywood which also acts as a storage shelf. I also added a spring to the hinged side as safety measure, in case one of us need to get into the cage for some reason, and stepped away from it, leaving the side panel open by mistake. The spring closes the door so if a forgetful human opens it up and leaves without latching it, the door will close by itself. It's up to the human to remember to latch the bolts. The theory is, that if the door is just closed but not latched, a cat who ventures out into the cage will see that there is no opening, and not try to get out. The barrel bolts prevent cats who try to get out from escaping. 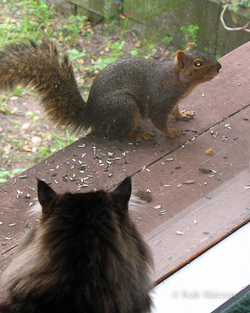 Its very secure, durable, cat and critter-proof. I stained the wooden parts before assembling the whole thing with brass hardware, so it looks nice as well. See additional images below for more views of the project and the security inspection team hard at work. 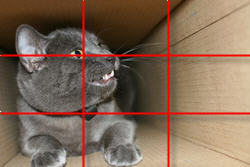 In just 5 minutes, learn some cool techniques for getting great shots of your feline friend(s). If you are comfortable fiddling with your camera's settings and spending a little more time to get your shot, you have even more flexibility for great pictures. The purpose of this article is to suggest how you can get great pet shots without fiddling with camera settings, apart from turning it on! Capture candid and spontaneous moments that don't look staged. Take pictures at kitty’s eye-level. 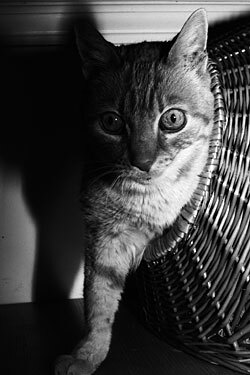 Include meaningful elements in your shot and show kitty enjoying himself. Good lighting is a very important part of getting great pictures. Use natural lighting and try to avoid using the flash if you can (except as noted below). Strong lighting from the side provides a great effect. Try to avoid scenes with very bright areas and very dark areas. Morning and afternoon light are excellent times to make natural-light photographs outside or next to windows. Avoid using your flash unless there are bright elements behind your subject. Avoid red-eye by turning your flash off or try to prevent your subjects from looking directly at the camera. 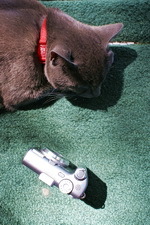 Many cats will be startled by some camera's pre-flash systems, it is best to avoid startling your cat in the first place by just not using the flash. Try to get a "catch-light" in your pet's eyes. A small bright glint of a light source reflected in the eyes will add life to your shot. Make sure kitty's eyes are in focus. If your camera doesn't allow you to control focus, or if you'd rather it focus for you, make sure kitty's face is near the center of the frame, hold the shutter button down half-way, to establish a focus and exposure lock (most modern cameras will do this) and recompose your shot if you like, without changing your distance from kitty. Brace yourself and/or the camera against something solid and unmoving whenever possible. Hold the camera as steady as possible, especially if you are not using the flash. Press the shutter button slowly and deliberately. There are rules. Some have been used by great artists for many years, some rules are meant to be broken, some just make sense. Ultimately, you get to decide what you like, but here are some guidelines. Don't put kitty's face right in the middle of the shot. Put her off to the side a little, Imagine your scene split up in to nine rectangles, all the same size. Where the lines intersect are good places for kitty's face/eyes. Be aware of foreground, middle ground and background elements. Avoid elements that interfere with your intended subject, like that wayward house-plant vine sticking down behind kitty's head.